We need 2 logos designed as part of an upcoming fundraiser for our terminally ill daughter..
We need to have 2 logos designed for an upcoming community fundraiser supporting current research into INAD. One of them is a design alteration of an awareness ribbon (3 Variations), and the other is a logo that's event specific. For the awareness ribbon, it will be used as part of an international campaign by the patient advocacy group. The attached file shows roughly what we're looking for, however we would like to have it altered to incorporate unraveled DNA as one of the ribbon strands merging into the solid ribbon. This would be preferably solid in colour. The colours for this are blue denim representing genetic disorders, silver for brain disorders, and the zebra pattern for rare disease. We would like the DNA itself to be silver. We need this in a format to be made into a pin, and for the website ([login to view URL]), and all media. The second variant on this would include the above work and the words on the ribbon, Great Water Balloon Fight of 2015, and possibly the web address. This would need to be scale-able from pin size to the main logo on the back of a T-shirt. We would also like a version that includes the stylized letters, Ayr, Ontario underneath the main artwork. 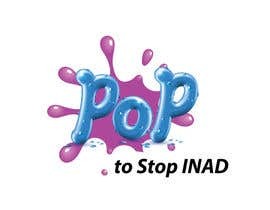 The second logo is event specific and would be a water balloon popping into a large splash, with the words 'Pop2Stop INAD' Incorporated. We are looking to break the Guinness record for most number of water balloons at an event. If this happens, we will gladly be back to have these designs retouched to include something uniquely signifying the fact (at a separate fee of course). Our event is to be held August 22nd, and we would like to have chosen the submission within the next week. This work will be recognized internationally as our advocacy group is worldwide..
We look forward to your submissions, and thank you for your time and effort.